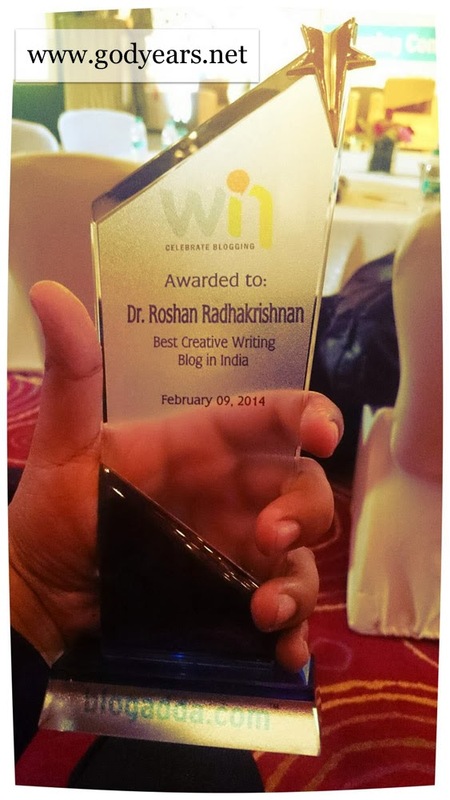 I want to start with some personal news before I talk about India's first Blog Conference and Awards function. 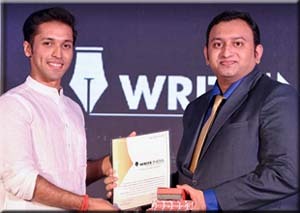 Best Creative Writing Blog IN INDIA! 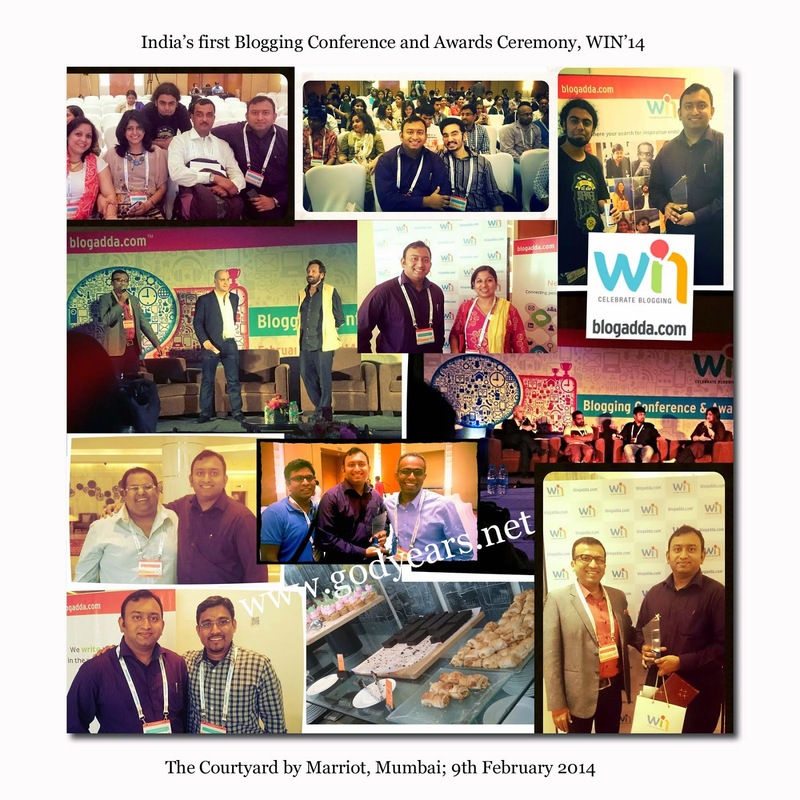 India's first Blog Conference and Awards function, WIN '14 organized by Blogadda was held at the Courtyard by Marriot in Mumbai on 9th February 2014. Hosted by 'that guy we know from that movie' Ashwin Mushran (self-depreciating, insightful, funny and spontaneous - a truly inspired choice for hosting), there were several brilliant sessions and discussions with authors, entrepreneurs, celebrities and celeb-bloggers taking the stage to speak on various aspects of blogging. I initially planned on describing all the sessions separately but quickly realised that this post would become bigger than my medical text books! 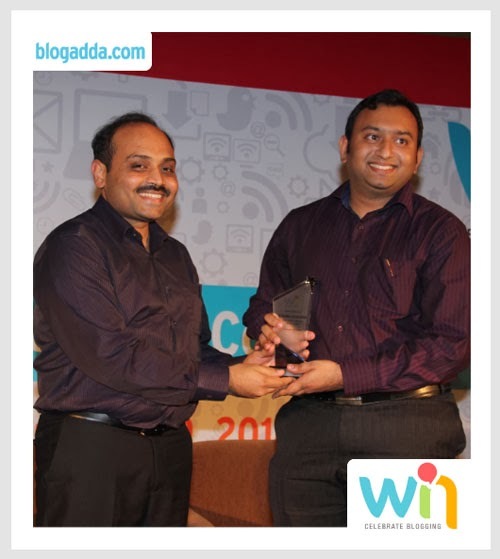 Anyway, simply go on to Twitter and type in the hashtag #WIN14 . You will be able to see direct quotes of the sessions which caught the imagination of the captive audience on that day. The value of pictures in blogs and as a form of storytelling by Anil P and Kavi Arasu set the tone for the day, being interactive and funny simultaneously. How blogs have begun to play a role in brand visibility and the advertising world (Anaggh Desai, Manu Prasad and Lakshmipathy Bhat). Some very succinct points were made here on the role of media. The session featuring Ekalavya Bhattacharya, Karl Gomes and Vasundhara Das dealt with travel, music and the Roadies show success story among other topics. This session was more light hearted and filled with lots of banter and even a sneak peek at one of Vasundhara Das's upcoming works (lovely voice she has!). 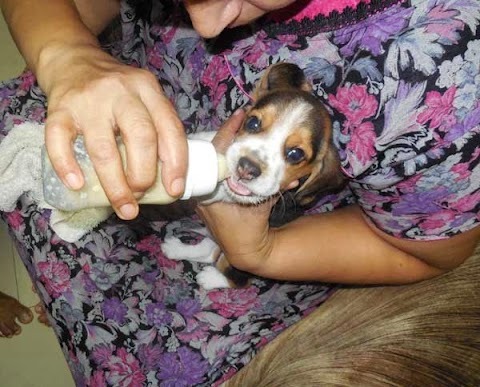 For the full album, click here. Director Padmashri Shekhar Kapur was there. I can only say this much - in a day filled with brilliant minds from the analytical to the creative, his session was still the show stopper. I really wish you all had been there, just for this one session, at least. He is easily the most insightful, knowledgeable and articulate person I have ever heard on stage. He had the crowd enthralled as he fielded questions and spoke on leaving a legacy for his child, the value of bloggers in today's world of restrictions on freedom of speech and what he saw coming in the days forward for the country. Amit Agarwal, Anuradha Goyal and Arjun Ravi all gave us glimpses into their lives and how they became successful names from their origins as regular bloggers. A stand up comedy act by Jamshed Rajan that had plenty of fun quips at bloggers and our merry ways. To me, the sessions pretty much mirrored what blogging is really all about. A little bit of every genre - fiction, financial gain, creativity, free speech, impact of the written word - was featured in just the right doses to keep the audiences engaged. On a personal level, it felt great to finally meet so many bloggers whom I had interacted with online over the last couple of years but never met before. My memory snapshot: Friends old &new, celebrities and an award I will cherish forever. Of course, I would be lying if I said there weren't elephant-butterflies in my stomach (it's my tummy, what else did you expect!) when the awards section began. While I did hope to win, I did not really expect it because I have a long history of 'being the bridesmaid but never the bride' where contests were concerned. Luckily, this time around, things worked out. 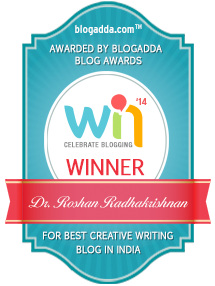 chose GODYEARS as the Best 'Creative Writing' Blog in INDIA. 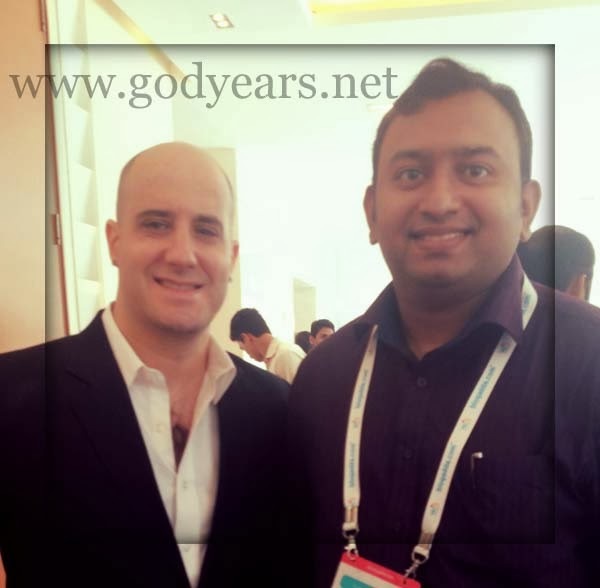 If nine years ago, you told me that I would still be blogging, I would have laughed at you. But a lot can happen over nine years, can't it? And pretty much everything has. Between humour and rage, love, movies, religion and family moments, I've seen the best and worst that life has to offer. If I've cribbed about my bad luck, I also know that I've been blessed in many ways too - winning in many national short story contests and thus being able to fulfill a childhood dream of being published. As with the blog, the stories too have been diverse ranging from romance to action, psychological thrillers to medical anecdotes. But winning this? This is as good as it gets for me. 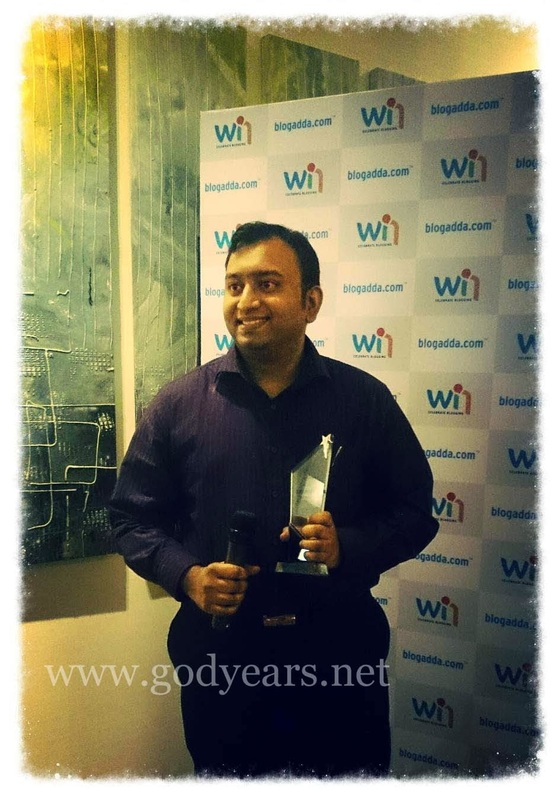 When I started writing this blog in 2005, if you had asked me what category I would like to be nominated for some day, I would have said just one word - 'Creativity'. It was the one thing I would have vainly wanted people to say while discussing the blog... that it was 'written by a really creative guy'. Today, I have a trophy immortalizing my dream. And a memory that will live on forever. 9 years.. That is some commitment! Yes, I'm used to showing off within the blog but this felt good as it's a celebration of the blog in real life. Congratulations doc. And keep up the good work. Looking forward to many more such rib tickiling and thought provoking blogs from you. Thanks Adel. Yes, I do intend to keep giving a mix of serious and fun posts in turns. haha.. yes. You're definitely gonna be there in the collage! Congratulations again!!! 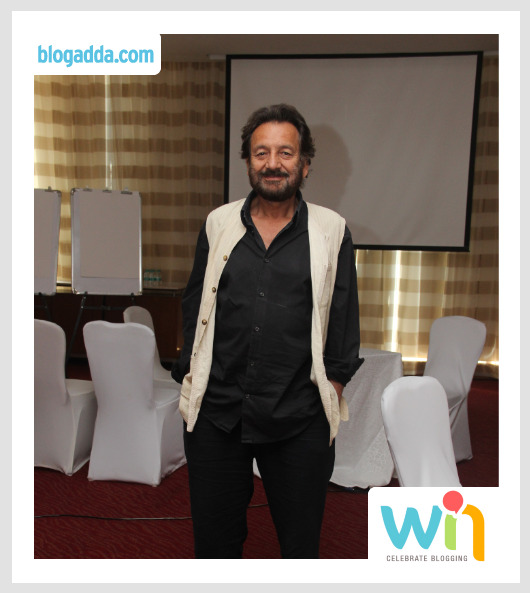 It sounds like a great event, and the talk by Shekhar Kapur seems to be the most talked about :). 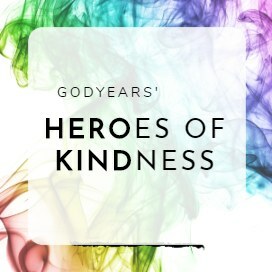 Looking forward to much more from Godyears!!! SORRY BUT I AM HELL JEALOUS OF YOU!! :D Thanks... green eyed envy from red hand... this does not bode well for me. Thanks so much :D Let's see where we go from here. Oh by the way congrats. grr. Gulp... between you and RED, there's a lot of green envy burning me up! I better be careful while crossing the road! Thanks sir. Means a lot. Wonder where to go from here though! Reached number one in India, next what ? Hey Doc.......Many Congratsssss.....Proud of ya.....Miles to go yet !!! My heartfelt congrats....and it is well-deserved! 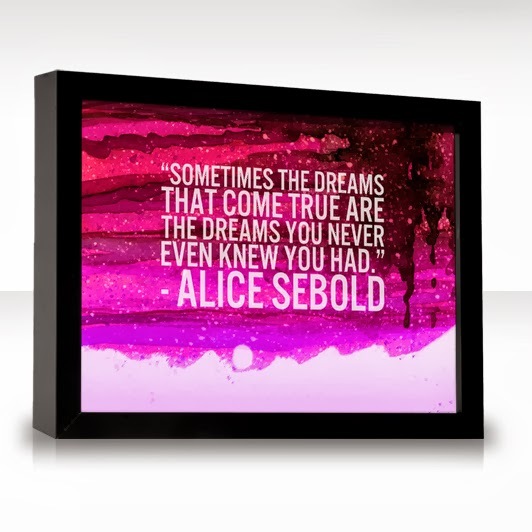 Amazing... and you deserve it ever so much! Love your writing! THis should mark the beginning of many more to come! COngrats again buddy! Considering the journey it's been, I'm curious myself to see where we go from here. I guess I'm an apt case for the saying "when one door closes, another opens", eh? Watching your space and your back buddy! Congratulations, do...once again. It was great to have met you. It was my honor. Enjoy the moment! Thanks Swarnali.. touchwood there will be more to come. Congratulations Roshan.. Nine Years :0 That is truly something !!! Congrats, Roshan! You deserve this Award for Creativity and I am certain that there are lots more to come you way besides the milestones that remain within your reach. Keep writing and inspiring! That's one of the best wishes I've received for this :) Touchwood, somebody's listening to your words and will help me achieve it all.